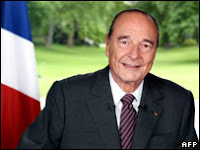 Jacques Chirac bids adieu to his dear France today, more than a decade after he became president in 1995. It’s an interesting time for Europe now with Tony Blair’s resignation last week and the recent French presidential elections confirming Sarkozy as the next Président de la République française. I can’t even remember Europe without those two! I wonder what Chirac will do in his retirement… after all; he was the mayor of Paris for 18 years before becoming president! Maybe he’ll go down to St. Tropez and spend the rest of his days lounging on the Med during the day and drinking his pastis and playing boules with the other old men of Provence? Or perhaps he’ll paint garden gnomes à la Monsieur Poulain (think Amélie). Either way, it will be a serious change of pace! 30 years in office! Mon Dieu! !